Many adult collectors are familiar with the Federal Duck Stamp Program and the collecting of the ever-popular duck stamps. Not as well known is its counterpart, the Junior Duck Stamp Program. Aimed at school-aged children, the program seeks to combine art and biology in an educational conservation contest. Collecting duck hunting stamps is an avenue of collecting that should be explained to young collectors, but yet is often overlooked. As leaders, we often emphasize and work with the types of stamps that are readily available: commemoratives, definitives, topical-related material, and covers. Yet we do these young collectors a great disservice by not sharing with them the beauty and value of federal duck hunting stamps honored at a reception. The first-place winner receives a $2,500 scholarship and the entry is made into a stamp. Junior duck stamps can be purchased from dealers as well as from the Duck Stamp Office. Revenues raised from the sale of these junior duck stamps are used to support state conservation efforts. And just like the federal duck stamp winning entry, the junior entry is allowed to be marketed. After introducing duck stamps to kids, it is rare that I don't have at least one young collector come back to report to me how he/she was able to attain duck stamps from friends or relatives that they know to be a duck hunter. 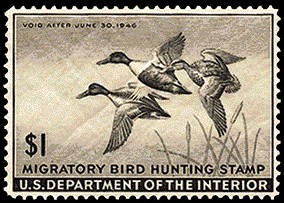 The story of the duck stamps is interesting and well worth repeating to the novice. Just as important is to teach the kids how to properly collect the stamps and the removal of the stamp from the license. After explaining that the federal duck stamp design is chosen from contest submissions by wildlife artists, take it one step further and share with them that there also exists a Junior Duck Stamp Conservation and Design Pro-gram. The junior program started in 1989 and has introduced thousands of youngsters to waterfowl conservation. Each state holds a junior competition with the best advancing to the nationwide contest in Washington DC. Run similarly to the federal competition, entries are judged on the accurate portrayal of waterfowl, artistic, and philatelic concepts. The first-, second-, and third-place finishers along with their art teachers receive a three-day trip to Washington DC to attend the Federal Duck Stamp Competition and are. The Badger History Bulletin, Winter 2000/2001 issue contained an interesting lesson that Bernard Vanden Berk developed for a fourth-grade class at Valley View Elementary School in Ashwaubenon. The bulletin is distributed three times a year to teachers and librarians throughout Wisconsin. The State Historical Society of Wisconsin from the Offices of School Services publishes it. Students identified those names and events that appeared consistently in their references. Then, working together in cooperative groups, the students made a "Top Ten" list of the names and events they considered most important to the history of Wisconsin. For each of their 10 choices, they had to justify their decisions as to why they were being placed on the list and why they were being given that particular ranking. Another idea might be to have the children design a stamp for one or more of their choices. Later, share the actual U.S. stamp design of the same person or event. Likewise, students could create designs for subjects not already commemorated on postage stamps but deemed worthy of such honor. In this particular class, the students learned that half of the people they selected were already commemorated on U.S. stamps. They also felt that two others deserved to be on stamps. Can you guess whom? The answer is at the end of this article. This lesson provided a wonderful hands-on activity for the students and encouraged higher levels of thinking. Stamp club leaders could easily adapt the lesson to fit the needs of their groups. It could be adapted to a specific time frame in history or to a particular theme. If you try this activity or one similar to this, I'd love to hear from you. And the answer to the above question: The students thought that Harry Houdini and Black Hawk should be portrayed on a stamp. And I have to agree with them! To celebrate our nation's 225th birthday on July 4, 2001, the U.S. Postal Service and the Smithsonian's National Postal Museum are teaming together to encourage elementary school students to participate in a special project called "Birthday Wishes to America." The USPS is hoping to set a world record for the most birthday wishes ever received by one addressee. Students are being asked to design and write birthday wishes that express their personal feelings and hopes for our country. The literature accompanying the announcement of this project contains three different classroom-writing activities. Each activity is a variation of the "birthday wishes" theme and whichever one was chosen takes only about 15 minutes of time to complete. In one activity, paper is folded into quarters. An illustration is drawn on the front of the "card." Inside, students are requested to write a four-line birthday sentiment. The saying can be serious or humorous. It can relate to a famous historic moment or person. As most students will be on vacation during the birthday celebration, they might also want to consider the postcard activity. Using a blank piece of 4-by-6-inch card stock, students can write their messages on one side and write the address and place a stamp on the other side. A letter-writing activity is suggested for those wishing to send a longer message. Students can write their thoughts about the nation turning the ripe old age of 225. They are asked to organize their thoughts and consider the tone and the key message. It's also suggested that the letter writers start with a little information about themselves or include one of their own favorite birthday memories. Birthday wishes are to be sent to: Birthday Wishes to America, c/o The National Postal Museum, P.O. Box 44100, Washington DC 20026-4100. You can follow the progress of the birthday wishes campaign on the Postal Service Web site. Plans are to announce campaign results and publicize selected birthday wishes at www.usps.com. The National Postal Museum will display some of the most creative and well-written birthday wishes. (Liberty Bell, Statue of Liberty, Flags, etc.) as well as important historic moments featured on U.S. stamps. Plan a scavenger hunt through a mixture of U.S. stamps. After a certain amount of time to pick and choose the stamps, have children hinge them to a piece of paper, title the page, and present their mini-exhibits to other group members. Complete your celebration with cake and candles. Youth philately - where is it headed? How can you make a difference? What tools do you need to have a successful program? These and other such questions are always spinning through my head - no concrete answers - just mulling around waiting for inspiration and more time. Many youth leaders must feel at times that they are the only ones out there trying to make a difference. They give of their time, knowledge, and materials - often for a small group. They have waited for a larger organization such as the U.S. Postal Service or the American Philatelic Society to step in and provide direction. But the needed help still has not arrived. True, there are small steps being taken to "band-aid" the situation, but the momentum for a truly unique and inspiring youth philatelic program has yet to be developed. In 1988, I was asked to write a piece for the "American Philatelic Congress Book," by Barbara Mueller, then editor. The Challenge section of the book was conceived to "hold up a mirror to contemporary philately, raise issues and consciousness, and propose solutions and policies." I wrote an article titled "Youth Philately: Ideas, Issues, and Insights." I recently reviewed the article. So how are we doing? Where are we heading? Admittedly, not very well! In fact, it is disappointing to think and to see that since 1988 very little has been accomplished. There are many reasons why, but this is no place to go into those reasons and place blame on anyone or anything. It is not too late to make a difference! I would like to hear from you. If you have a youth group, what do you need to keep it going? If you are thinking about starting a group or helping with a group, what has stopped you from making the commitment? Please write to me at: P.O. Box 1451, Waukesha, WI 53187. Collecting foreign stamps can lead young minds on a new adventure. To stimulate interest in these faraway places and aid in the learning experience while offering flexibility and creativity, try this hands-on activity. Each child will need a large grocery-size paper bag, approximately eight four-inch-by-six-inch recipe/file cards, hinges, writing tools, scissors, glue, foreign stamps from one country, and research materials such as a Scott catalog, atlas, reference books, or encyclopedias. Final products can be embellished with color by using markers, crayons, etc. Depending upon the philatelic resources available, you may have to limit the number of countries for the activity. Each collector (or group of collectors) selects one foreign country. The name of the country is written on one of the file cards. On a second card, some basic information specific to that country should be noted. It could be, for instance, information found at the beginning of the country listing in the catalog. (The Scott catalog details location, type of government, area, and population of each country.) Additional facts might be required depending upon the age of the child, ability to do research, and reference material available. For example, the capital of the country and its currency could be added. The youth then searches through the stamps available from that country and begins sorting them into categories. Stamps depicting animals, plants, costumes, leaders, flags and other symbols are some possible topics. Categories chosen should somehow relate to and illustrate the culture of the country. The youth then labels each category on a file card and hinges the appropriate stamps - one category per card. Open a large grocery bag so that it lays flat. Trim any uneven and unsightly edges. On opposite sides, make fringe by cutting half-inch strips approximately three inches into the center of the bag. Using the plain brown side, neatly arrange the file cards (title, information, and stamp cards) onto the paper bag. Glue into place. If desired, the "magic carpet" can be enhanced with crayon or markers. These philatelic carpets make a nice youth display in a school or library setting. Do you have any favorite activities involving foreign stamps that you use with beginning stamp collectors? If so, I would like to hear about them. Please write to me at the address shown above. This past July Fourth was the 225th birthday of our country. Although not much hoopla was made of this event, it remains a milestone and one that we should be proud to celebrate. The U.S. Postal Service and the Smithsonian's National Postal Museum teamed together to encourage students through their elementary schools to participate in a special project called "Birthday Wishes to America." The USPS was hoping to set a world record for the most birthday wishes ever received by one addressee. The publicity mailing for this project, which also included several activities for club leaders to use, arrived almost too late for school participation. It was promised that examples of entries would be posted on the Postal Service's Web site, but as of this writing, I have not seen any. I was determined not to let the event go by without a philatelic salute of some sort, so I devised this contest with sponsorship through the American Topical Association. It's easy! Allows for kid creativity! And showcases our country, its history, geography, and important people from a philatelic view! Being told. Prizes will be awarded in four age categories: 6-9, 9-11, 12-14, and 15-17. Youth groups are encouraged to make this a club project. All participants will receive a gift for entering. Winners will be announced in a future issue of Topical Time, journal of the American Topical Association. One-page Topical Exhibit Contest Rules The contest is open to any youth under 18 years of age. Submit entries in the form of a photocopy of an exhibit prepared on one 81/2-by- 11 -inch page. The exhibit page must include a mini-mum of six different stamps and/or philatelic items depicting a topical subject. The subject must relate to some aspect of our country: its states, people, symbols, historic events, culture, etc. The subject can be general (e.g., presidents of the United States), or specific (e.g., John F. Kennedy) in nature. For one specific president, the focus would be on telling the story of his life and/or his accomplishments as a leader of our country. Each entry must have an appropriate title. Other description is encouraged and should support research related to the topic. Writing may be neatly handwritten, typed or computer generated. October was National Stamp Collecting Month (NSCM). The theme this year was "Stamp Collecting: Your Passport to the World". The September issue of ATFP carried my article on how to create a philatelic magic carpet ride. This youth activity would appropriately complement the NSCM theme as well as make a nice display for a school or library setting. Here are a few more ideas that leaders can use to carry through on the NSCM theme. Create another display by using a costumed paper doll. The Evan-Moor Corp. (publisher of educational materials) has a reproducible book titled "Children Around the World". It was published in 1992 and may still be available at teacher supply stores. Each of the costumed boy and girl dolls presented in the book have a top and bottom dressed body. Children color the dolls, cut them out, and assemble them. The mid-section of the doll's body is supposed to be lined paper upon which text, such as a country report, is written. Plain paper can be substituted with stamps representing the country of the ethnic doll mounted on the paper. These dolls also serve as a fun-filled educational tool for the younger stamp collector. Create your own album pages to complement the foreign stamps you have available for the children. Today's technology makes it easier than ever to produce computer-generated pages. In addition to titling the page, computer graphics allow you to insert maps, flags, and other symbols representative of the country. Those without access to computer graphics may wish to substitute inexpensive stickers available at many variety stores. I have found stickers depicting flags of the world. My favorite stickers show ethnic children saying "hello" in their native tongues. Reproduce these album pages from your master copy and you are on your way to sharing the world through foreign stamps with your young collecting friends. Flash cards? Create flash cards to aid young collectors in country identification. On one side of the card, write the country name as it appears on stamps. The other side of the card should have the English equivalent. The cards can be used in many ways. They can be used for independent instruction or self-study. Try using the cards in a large group activity such as the popular flash card "Around the World" game. In this activity, one student stars by standing next to another student. Upon seeing the card, the students try to be the first to correctly identify the country name. The first correct answerer moves on the challenge the next student. The object of the game is for a student to so successfully identify each country name that he or she makes it around the complete group of challengers. This activity is sure to generate a little noise as kids get so involved in the game that they shout out the answers in their excitement. I have also used the cards in a paired activity of tic-tac-toe. A game board is made on a piece of paper. The cards are placed in a pile with the foreign name side of the card facing up. The first player must correctly identify the country name before placing his "X" on the game board. (The cards are self-checking -- players can turn them over to see the correct answer.) The second player must identify the next country's card and if correct, place his "O". An incorrect answer is a lost turn. The Collector's Club of Chicago has come up with a novel idea. Perhaps it will introduce youth to stamp collecting. At the very least, it offers a tool for teachers and adults interested in promoting the hobby to young collectors. The AskPhil Academy at www.AskPhil.org offers 13 mini-lessons on a variety of stamp collecting subjects. James Ashby prepared the courses. From the introductory page, it is apparent that the CCC plans additional courses and new features. This could be a wonderful opportunity for adults to work with children, their own or others. Lessons take but a few minutes to read through and have only five multiple-choice questions to answer. (The project works on the honor system - you are trusted to have completed the course work.) Cartoons were educational. In Camp Coin, I found material I could use with a mystery unit I was teaching at school. I also found a listing of the requirements to receive the Boy Scout merit badge for coin collecting. The teacher's section was currently running a contest whereby teachers submit innovative ideas for using coins in the classroom. These ideas will then be posted on the Web. I have a lot more exploring to do at that website as I see many parallels between coin and stamp collecting. Have you visited the U.S. Mint website? If so, I would appreciate your comments. You can write to me at the address shown above. Although not philatelic, have you seen the website for kids developed by the U.S. Mint? I was very impressed when I saw how attractive and interesting they had made the field of numismatics. The U.S. Postal Service might take a lesson from them. The Web address is www.usmint.gov. You enter the kids area through clicking on h.i.p. pocket change. There are games, cartoons, a time machine, coin news, Camp Coin, and a section for teachers.